Not by PAF, the formation was unintentionally formed by Indonesian Air Force in May 3rd 2017 during Jogja International Air Show event. See EXPLANATION and REFERENCE section for more detail. http://bit.ly/2YrXypi https://archive.fo/gUf1U, an article by “TNS World”. See NOTES section in the end of this post for other source. Complete copy of article content is in (2) section REFERENCE. When genuine content is shared with false contextual information”. The SOURCE article shared a picture of a formation by Indonesian Air Force in May 3rd 2017 during Jogja International Air Show event. 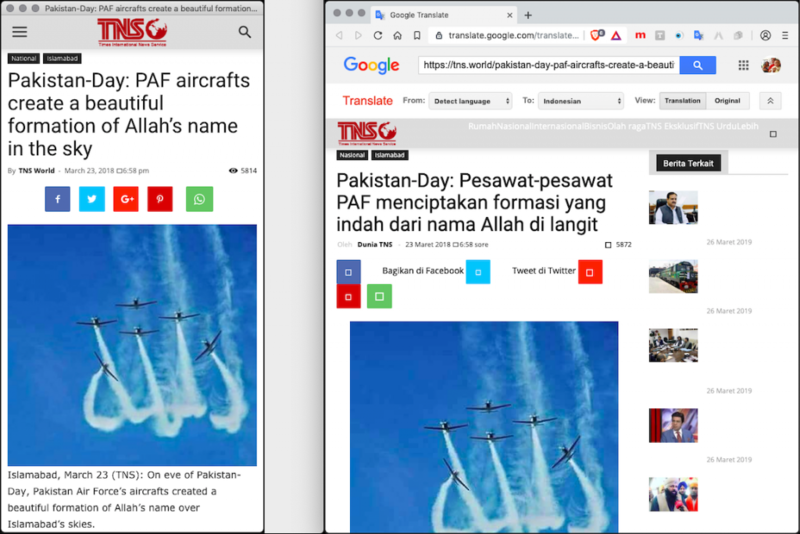 The SOURCE claim of “On eve of Pakistan-Day, Pakistan Air Force’s aircrafts created a beautiful formation of Allah’s name over Islamabad’s skies” is false. On the location of the event, on the date, and on the performers. 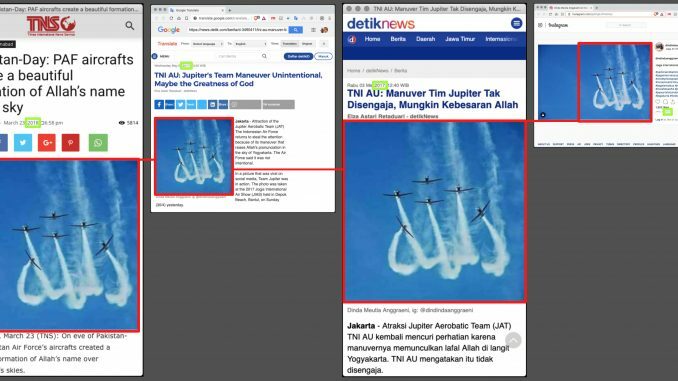 One of related news, detikNews @ May 3rd 2017: “TNI AU: Jupiter’s Team Maneuver Unintentional, Maybe the Greatness of God”, complete copy of article content is in (1) section REFERENCE. 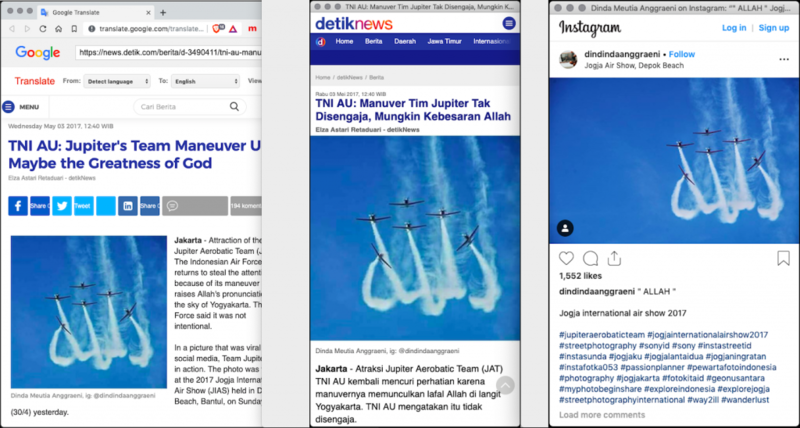 Jakarta – Attraction of the Jupiter Aerobatic Team (JAT) The Indonesian Air Force returns to steal the attention because of its maneuver that raises Allah’s pronunciation in the sky of Yogyakarta. The Air Force said it was not intentional. In a picture that was viral on social media, Team Jupiter was in action. The photo was taken at the 2017 Jogja International Air Show (JIAS) held in Depok Beach, Bantul, on Sunday (30/4) yesterday. 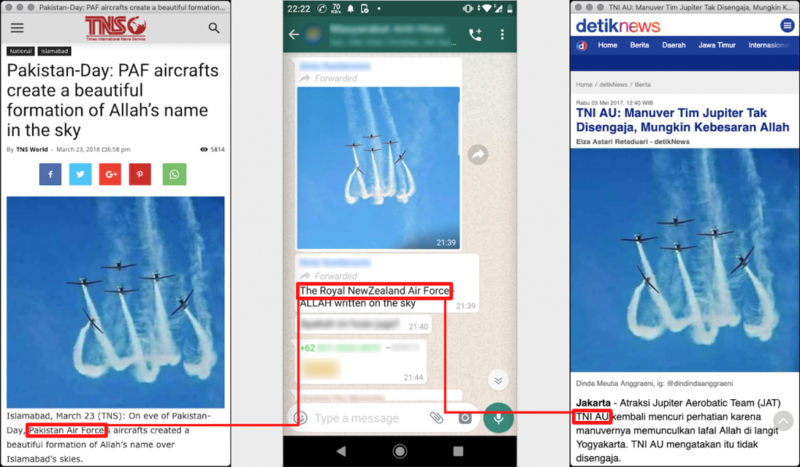 “Air shows in the framework of the Indonesian Aerospace in Yogyakarta,” said Air Force Kadispen Marsma Jemi Trisonjaya when confirmed by AFP on Wednesday (05/03/2017). In this viral photo, there are 6 planes forming a formation. Two at the far end even in a tilted position. From the smoke released by the 6 planes, it turned out to form a recitation of Allah. But apparently, this was not intentional. The formation has indeed been trained, but for Allah’s pronunciation form, Jemi said it was not a form of intent. “Unintentionally, it might be the greatness of God, so that it can form the writing of God,” he explained. Team Jupiter does have a lot of maneuvering in every appearance. But the most famous is the maneuver that forms the heart or love in the air. “If the love is indeed a formation that is made and trained,” explained Jemi. Various other Team Jupiter maneuvers such as crossing, oak-maneuvering and sliding perpendicular to the top. Usually 6 types of KT-1 Wong Bee aircraft emit smoke on their tails. The thrilling attractions of Team Jupiter are the main attraction. 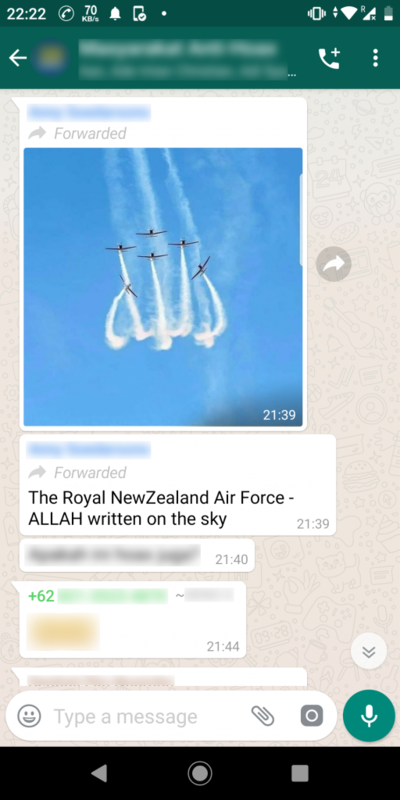 Also distributed via Whatsapp broadcast message in Indonesia using narrative “The Royal NewZealand Air Force – ALLAH written on the sky”, most likely related to recent mass shooting incident in New Zealand.